Well to begin, calling someone your mentor can make them feel unaccessible. It can be uncomfortable to have sensitive conversations and build an intimate relationship with someone we idealize. Often expectations or ideals of someone we put on a pedestal can be shattered and ruin that relationship. I personally would hate to create a strain with someone so influential to me because of my unrealistic idea of them being shattered. Sounds like a dramatic situation but it happens. When we build people up it’s very easy for them to let us down. Personally, I’ve found more often then not, someone will tell me what I can’t do based off of their experiences (or lack there of). F*ck that. Yes some professions need mentors but everyone doesn’t. For many of us we’re going places that others have never been. We’re making moves those before us couldn’t fathom. 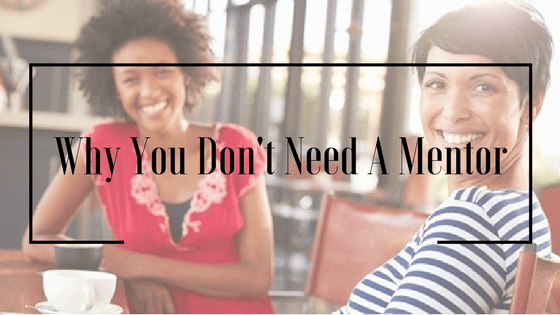 Why do we need you’re mentorship on a journey you know nothing about? If we don’t have a mentor who do we turn to for information? Instead of a mentor I’ve always believed in a network. We all know people who are really good at something. Whether it’s makeup, writing, party planning, resume creating, home decorating or simply persuading others, we all know someone who is an expert at something. Those people create our networks. These networks are filled with friends you can talk to about anything while learning how to navigate your professional world. I’ve always chosen my friends based on vibes and smart conversation, no matter their background, age, gender or race. Sharing your story on how you started a business or got a promotion at work are the things we google. Having people in your life who’ve strategically done those things who can walk you through them are great. It’s even greater when their your peer and not your superior. They may not share the same career but have encountered some of the same obstacles you’ve encountered on your path to fulfilling your dreams. Those people are the people you need in your network. We all need someone who’ll honestly talk to you about the truth without any superiority. A lot of times we just need to talk to someone we relate to and most of the time those are already friends. This isn’t an article bashing mentors. If you want one or have one that’s great. If you don’t have, can’t find or understand the point of a mentor be fine with that. Not everyone is meant to have a mentor. I’m a firm believer that you can learn something from everyone especially those around you. Just maybe the guidance you’re seeking is right there waiting for you to tap into it. TAP IN!